CLICK TABLE HEADER COLUMNS TO SORT BY ASCENDING OR DESCENDING ORDER. Never compare yourself with the others, says the wise. Normally, the word "conceit" in English and ma2-na1 in Burmese is associated with someone who considers oneself to be superior than the others. Interestingly, "Mana" in Pali language is the conceit "I" that not only compares oneself to be superior than the others. When one considers oneself equal to or inferior than the others, that is also conceit. All three types of comparisons are rooted in the false concept of "I" ego entity that keeps us binding in the cycle of suffering known as thun2-tha1-ya2 (Samsara in Pali), according to the ancient wisdom. However, for practical purposes, we cannot get away with words of comparisons. This is good. That is better. That one is the best. She is taller than I. He is the tallest and the biggest, and so on. The burmese adjective word po2 (adjective), which roughly means "more", is used to describe that something or someone is better, taller, bigger, and so on. However, it should be noted that "more" in degree can go in either positive or negative direction. For example, "more short" means shorter. "More bad" means worse. da2 po2 xxxx deare2 where you substitute xxxx with the adjective of your choice. You should also learn to put comparisons in the form of questions. They follow the same pattern, so I will just give one example. beare2 ha2 po2 koun3 tha1 leare3 -- Which (one) is better? da2 (pronoun) means "this". ta2 (particle) is written in different Burmese character, but is pronounced almost like da2. It is spoken in reference to the object "which is" or "that which is". The example below shows how ta2 modifies the adjective po2 kji3 (bigger) into a noun phrase po2 kji3 ta2 (that which is bigger). po2 kji3 ta2 lo2 chin2 deare2 -- I want a bigger one. In the above examples, I am pointing to something and say this is bigger, and so on. What if I want to say something is bigger than this that I am pointing at? In that case, you need to use di1 htet (more than this) with the conjunction htet instead of da2 (this). How's the weather in Toronto (compared to Yangon)? We will now build up a longer sentence. Toronto gah1 Yangon htet po2 ay3 deare2 -- Toronto is colder than Yangon. Yangon gah1 Toronto htet po2 pu2 deare2 -- Yangon is warmer than Toronto. Actually, the weather in Toronto is much, much colder than Yangon. If you compare Yangon to Maymyo (Pyin Oo Lwin), a tourist attraction in Myanmar, it is quite appropriate to say, di1 htet po2 ay3 deare2. But, if you compare Yangon to Toronto, it's better to stress that Toronto is "much" colder. The Burmese word for indefinite pronoun "much" in such a situation is a-mya3-ji3. It literally means "so many" or "great quantity". di1 htet a-mya3-ji3 po2 ay3 deare2 -- It's much colder than this! 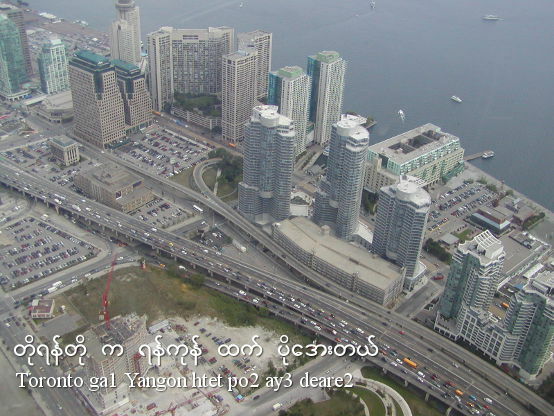 Toronto gah1 Yangon htet a-mya3-ji3 po2 ay3 deare2 -- Toronto is much colder than Yangon. So, you can say ay3 deare2 if the object or the environment has a low temperature. Likewise, pu2 deare2 means the object or the weather has a high temperature. Burmese language has a different word if your body feels cold due to the weather. If you're shivering in sub-zero temperature, you say chan3 deare2. Perhaps, the more useful word that you can say is ike deare2 if you are sweating under the sweltering heat in the hottest month around April in Myanmar. Words such as "feel cold", "feel warm", "feel happy", and "feel sad" are one syllable verbs. In comparison, "happy" "sad", "warm", "cold" are adjectives in English. Example: I feel cold. In Burmese word chan3, "feel" is already included in "cold". pu2 lite da2 -- The weather is so hot (to the extreme). ike lite da2 -- I feel so hot! Be careful with pronunciation. pu2 is pronounced like poo2, not pa1 yu2. This is the biggest one! The dash "-" after the suffix "a" is optional, but I will use it just to show the adjective clearly. da2 a-kji3-zone3 beare3 -- This is the biggest! Just like in English, superlatives in Burmese cover the extremes in both directions to include the best and the worst, the biggest and the smallest, the tallest and the shortest, and so on. By the way, did you notice that there is just a slight tone difference between the shortest (person) and the hottest? a-pyau2-zone3 nay1 means happiest day. For Burmese people of all ages, it comes in Mid April every year when Water Festival and New Year is celebrated. And it is not a single day. In 2017, the government of Myanmar had announced the plan to cut the holidays from 10 days to 5. The announcement which came too close to the holidays was reverted back after the public responded with much anger and dissatisfaction. The cut will start in 2018. The five days will be redistributed with other holidays in cooler months. Instead of saying, "this is the best" in reference to the object, can we make comparisons between people? How would you say he is the best and the brightest? thu2 a-tau2-zone3 beare3 -- He/she is the best and the brightest. I have included a list of superlatives in the table on the left side. Just like "better", we will now learn to put superlative terms in the form of questions. Since the pattern is the same for such questions, I will give just one example. beare2 ha2 a-koun3-zone3 leare3 -- Which (one) is the best? Similarly, you can ask who is the best, the tallest, the shortest, or the brightest, etc..
beare2 thu2 a-tau2-zone3 leare3 -- Who is the best? Here's an another useful question that you can ask. beare2 a-chain2 a-koun3-zone3 leare3 -- When is the best time? In the second sentence, "the best" refers to "how" of the verb "do". So, it is an adverb. thit mya3 dwin2 a-koun3-zone3 dthi2 kjoon3-thit pfyit dthi2 -- Teak is the best among the woods. Where is the highest mountain in the World? Now, for the last part, we will build up the a-shay2-zone3 (longest) sentence of this lesson. ka1-ba2 pau2-hma2 a-myin1-zone3 toun2 beare2-hma2 shi1 leare3 -- Where is the highest mountain in the World?